The faltering U.S. economy was the No. 1 story in the American news media in 2011, with coverage increasing substantially from a year earlier when economic unease helped alter the political landscape in the midterm elections, according to The Year in the News 2011, a new report conducted by the Pew Research Center’s Project for Excellence in Journalism. The year 2011 was also characterized by a jump of more than a third in coverage of international news, by a growing contrast in the content of the three broadcast networks and by a series of dramatic breaking news events that dominated coverage in ways unprecedented in PEJ’s five years of studying news agenda. The biggest story of the year, however, was the economy. As the recovery weakened and Washington engaged in partisan warfare over the debt ceiling, news about the state of the economy jumped to the same level of attention it had received in 2009 when newly elected president Barack Obama passed his controversial stimulus package in response to the “Great Recession.” For all of 2011, the economy made up 20% of the space studied in newspapers and online and time on television and radio news, an increase of more than 40% from 14% of the newshole studied in 2010. The unfolding uprisings in the Middle East-from the mass protests in Egypt in February to the hunt for Muammar Gaddafi in October-was the second biggest story of the year. 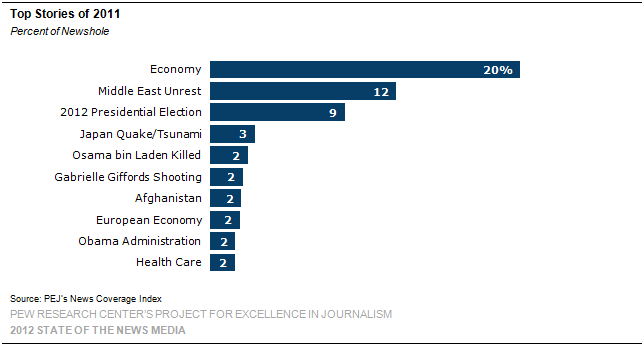 Those events filled 12% of the newshole studied in 2011. That makes the Middle East uprisings the second- biggest annual foreign story on record since PEJ began analyzing the news agenda five years earlier. The only bigger international story was Iraq in 2007, the year of the “surge” under George Bush. The biggest component of the Mideast story in 2011 was the uprising in Libya, which involved international military intervention and the dramatic search for the fleeing Libyan dictator. The overthrow of Hosni Mubarak in Egypt was the second biggest part of the Mideast uprisings story. The ongoing violence in Syria was the third biggest element. The No. 3 story of the year overall in 2011 was the race for U.S. president, even though no primary or caucus has yet been held or single vote cast. The race for president consumed 9% of the news space in the last year. What was once called pre-primary period, or the invisible primary, is invisible no longer. Four years ago, in 2007, with nomination battles raging in both parties, the presidential campaign was a bigger story, however, accounting for 11% of the newshole. PEJ’s The Year in the News is derived from an analysis of close to 46,000 stories produced from January 1-December 11, 2011 that were examined as part of the group’s ongoing content analysis of 52 different traditional news outlets from the main five media sectors, its News Coverage Index. The report also includes an analysis of the year in social media, based on the group’s weekly analysis of blogs and Twitter, the New Media Index. 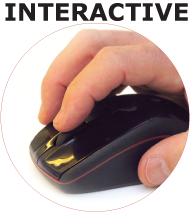 The findings are also available for users to examine themselves in PEJ’s Year in the News Interactive, where users can delve into the data base by story, by broad topic and compare different news sectors and outlets with one another. After the top three stories, a host of major breaking news stories, followed by a group of ongoing trend stories, filled out the top 10 stories of the year. The March 11 Japanese earthquake and tsunami was the 4th biggest story (3% of the newshole), followed by the May 1 killing of Osama bin Laden (2%), and the January 8 Tucson shooting of Congresswoman Gabrielle Giffords that wounded 18 other people, six of them fatally (2%). The week it happened, the killing of bin Laden was the biggest story in any given week in 2011, when it accounted for 69% of all the news studied. That made it the biggest one-week story recorded since PEJ began monitoring the news agenda. The next four stories were ongoing events-the situation in Afghanistan, the European economic crisis, coverage of the Obama Administration (including the workings of the West Wing and family issues, but not including policy debates) and the health care debate. A year ago, in 2010, education, immigration and the fight against terrorism were all among the top 10 stories. They fell back just slightly in 2011 (to 11th for education and 12th for terror threats). Immigration fell to No. 18. In general, the public tended to agree with the news agenda of the media in 2011, at least as measured by new data from the Pew Research Center for the People & the Press in its weekly comparison of what stories the media covered and what the public was following. On several of the biggest stories of the year, such as the killing of bin Laden, the Japanese earthquake and the shootings in Tucson, public attention matched the high level of media coverage. Where the public tended to differ with the media in 2011 is that their interest in some stories tended to last longer than the media’s. One significant difference in 2011 was the heavier focus on international news. Five of the 10 biggest stories of the year (and eight of the top 20) were international. Together these five stories alone accounted for 21% of the newshole studied. A year ago, only two of the top 10 stories were international (Afghanistan and the Haiti earthquake), representing 6% of the news agenda. The increase in foreign news in 2011 also came despite a drop in coverage of the war in Afghanistan-the major U.S. military engagement in the world. 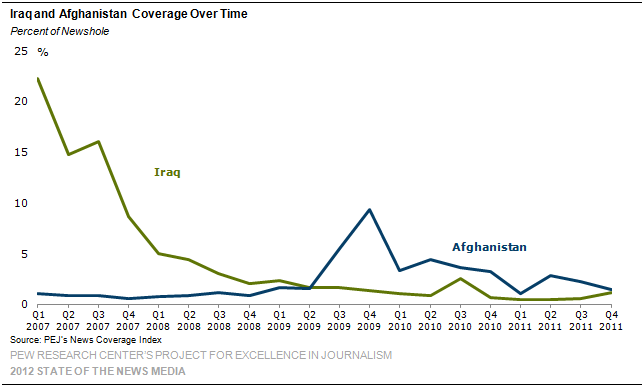 Coverage of the war dropped by half-to 2% in 2011 from 4% in 2010. And when all stories-not just the top 10 of the year-are tallied together, the percentage of foreign news grows even more. By that measure, 28% of the news studied was international. The largest share (18%) focused on strictly foreign events. Another 10% focused on events in which the U.S. was directly involved. That is an increase of more than a third from a year ago, when the total newshole for international events was 20%. Another difference in 2011 was that the focus of economic coverage shifted. The story changed from being about taxes and jobs to being much more a story about government. Almost a third of the economic coverage in the last year (32%) was focused on the budget and national debt (heavily influenced by the debt ceiling crisis). The second biggest storyline was the effect the economy was having on state and local government (12% of the economy coverage). A year ago the two biggest themes were taxes and unemployment. One new aspect to the economy story in 2011-the Occupy Wall Street Protests which began in September-proved to be the fourth-biggest storyline, at 5% of the overall economic coverage.